I love queso, but I am not a big fan of the “processed cheese product” that is typically used to give this dip its creamy consistency. Besides being high in sodium, many processed cheeses are made with hormone-laden dairy and lots of preservatives. I avoid these pitfalls in my recipe by creating a creamy organic cheese blend from scratch, using locally-grown organic peppers, spices and cheeses, sans the chemicals. Like the velveeta version, this queso recipe will stand up to hours of heat in the crock pot without separating, and it’s a snap to put together. I kept this recipe of queso covered on warm in the slow cooker for four hours yesterday before serving, and it held steady the whole time! The secret ingredient that makes it so creamy and low maintenance is butternut squash puree. The squash adds a lovely golden color to the cheese and enhances the texture, keeping it from getting stringy as it melts. A basic roux in the early part of the recipe also helps to stabilize the cheese. 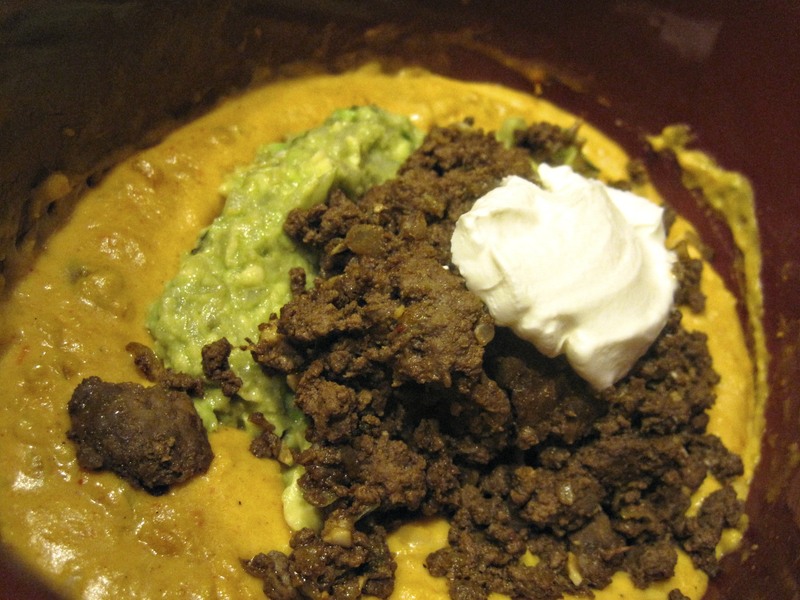 As you can see, I added venison taco meat, guacamole made with local avocados, and sour cream to my queso just before serving yesterday. The resulting appetizer was similar to the Bob Armstrong dip served at Matt’s El Rancho in Austin and Dallas. I probably would have ended up with Kerbey Queso (cheese dip topped with guac and pico de gallo) if tomatoes had been in season at the market this weekend. Since butternut squash is so easy to find here in Austin, I suspect I’ll get a chance to make this fabulous queso again for some Texas Longhorn tailgates, when fresh tomatoes are a plenty. In a heavy bottomed saucepan, saute minced onions in butter over medium heat until onions begin to soften. Add flour to the pan and stir constantly for about 5 minutes, until flour is golden brown. Add milk 1/4 cup at a time, stirring constantly. Cook until milk is warmed through and turns light brown. Next, add the squash puree, stirring until combined, followed by the cheeses, peppers, and spices. Continue stirring for about 5 minutes until all the cheeses are completely melted and the mixture is creamy. Remove queso from the stove and serve immediately or transfer to a slow cooker, covered and set to “warm” until ready to serve. This entry was posted in Dietary Restrictions, Recipes, Sides & Appetizers, Vegetarian and tagged Butternut squash, Cheese, Food, Onion, Pepper, postaday2011, Recipe, vegetarian. Bookmark the permalink. Kathryn, this looks like a sure winner. I just love the use of the butternut squash with all the ingredients. I don’t have a good sharp knife at this time, so I will probably purchase cut up squash at my local Japanese vegetable place. I really would like to try this dip soon. It has all the ingredients I so love so I know that it will be soon. Thanks so much for sharing it with us. Thanks so much, Judimae. I’m impressed that you can purchase cubed, cut squash. I bet canned pumpkin puree might work well, too. I’m so excited! I had given up making queso and now there is hope. Thanks, Kathryn. This look aboslutely delicious! I can’t wait to try it.